Home Auto Canadian debut of the all-new 2020 Jeep® Gladiator. Canadian debut of the all-new 2020 Jeep® Gladiator. 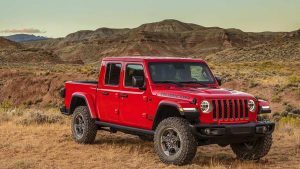 Montréal, Québec: At the 2019 Montreal International Auto Show, FCA Canada announced the Canadian debut of the all-new 2020 Jeep® Gladiator. The most capable midsize truck ever builds on a rich heritage of tough, dependable Jeep trucks with an unmatched combination of rugged utility, authentic Jeep design, open-air freedom, clever functionality and versatility, best-in-class towing and 4×4 payload, advanced fuel-efficient powertrains, superior on- and off-road dynamics and a host of innovative safety and advanced technology features. The all-new 2020 Jeep Gladiator delivers unmatched capability with best-in-class towing and 4×4 payload capacity, composed on-road driving dynamics and passenger safety. Legendary off-road capability comes courtesy of the Command-Trac and on Rubicon models Rock-Trac 4×4 systems, third-generation Dana 44 axles, Tru-Lock electric front- and rear-axle lockers, Trac-Lok limited-slip differential, segment-exclusive sway-bar disconnect and 33-inch off-road tires. The Jeep design team kept the legendary seven-slot grille seen on Wrangler but widened the grille slots for additional air intake to assist with the best-in-class towing capacity. The top of the keystone-shaped grille is gently swept back to enhance aerodynamics. The all-new Jeep Gladiator offers the proven 3.6-litre Pentastar V-6 engine at launch with a 3.0-litre EcoDiesel V-6 engine being offered in 2020. The 3.0-litre EcoDiesel engine is rated at 260 horsepower and 442 lb.-ft. of torque, with ESS standard. An eight-speed automatic transmission is standard and is designed to handle the increased torque output. The Gladiator hits showrooms in mid-2019.